He wasn’t diagnosed until a specialized test caught the discrepancy between his reading comprehension and math scores in Alaska. A district psychologist asked for permission to test him for dyscalculia, a particularly misunderstood dragon with a flair for the dramatic, artistry and with a decidedly poor aim based on an inability to calculate the distance between objects well. When my father was going through school, there was barely a term for it and almost no research had been done. When I was going through school, dyscalculia had made its way into the vocabulary of researchers but not teachers. Today, teachers understand the basic premises of dyscalculia if not the adaptive nature of those who bear the scars of the disability on their report cards. For Carson, the issue arises when he must use basic math skills to solve a problem. He, like me, like his grandfather before him, cannot conjure up images of numbers behind world problems, such as: Train A, traveling 70 miles per hour (mph), leaves Westford heading toward Eastford, 260 miles away. At the same time Train B, traveling 60 mph, leaves Eastford heading toward Westford. When do the two trains meet? How far from each city do they meet? People with dyscalculia cannot easily read analog clocks or balance our checkbooks or memorize multiplication tables or a multitude of other number-related basic skills that make life so much more functional for balanced brains out there. I didn’t know any of this before Carson was diagnosed. I spent my childhood wondering why I couldn’t do math and overcompensating in the things I could do well. Things like reading and writing and social interaction. Oregon requires new students to be re-tested in order to accept their IEP, or Individualized Education Program. IEPs follow students around from town to town or state to state and allow them the chance at an equalized learning process wherever they land. Carson’s most recent test said the same thing as his Illinois test, which said the same thing as his Alaska test. He’s dyscalculic and needs a little help to succeed, especially in an over-tested academic environment that relies on clumping all children into proficiency quotas. It also told us something we’ve seen for a long time. He overcompensates in reading and writing. In fact, his comprehension and communication skills are quite a bit higher than average. It’s the same for his grandfather and I. Both of us are good communicators, strong writers and storytellers. We overcompensated for our inability to comprehend the analytical world of math in order to find our niche in this world. 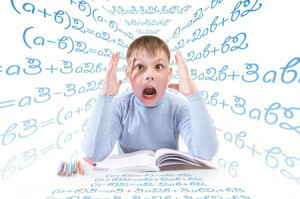 Dyscalculia, for all that is not known about it, such as what it stems from, how long it has been present in the human mind, why it’s passed down genetically or even how to begin treating it, has likely been a part of the human story for a long, long time. There is evidence of dyscalculia dating back for centuries, and in modern times, there is actually quantifiable evidence that some or many of our literary luminaries also struggled in reading analog clocks. The most interesting thing to me in all of this is that every time I sit down with one of Carson’s school counselor or even his teachers, I learn something new about myself. Dyscalculia, and its emergence in the vocabulary of our education system, has forced open the conversation about how and why children learn. When it was ill-understood, back in the dark ages of my own academic career, kids mostly adapted to it. Some did not, especially those who had to deal with both ADHD and dyscalculia. And each time I learn a little more about how schools are approaching it, I understand a little more about how I have learned to function as an adult with dyscalculia. It’s all part of how people with learning disabilities adapt to overcome them, something that I hope is not lost in our new understanding of this particular disorder. My son is getting help now for something that most teachers didn’t even know existed in the 80s and 90s when I went to school, much less when my father attended in the 50s and 60s. But the expectations are also higher as well as the notion that we can stuff kids with learning disabilities into the best (for us) levels of our standardized education system. And there’s not as much freedom to adapt anymore. In fact, if anything, the pressure is far greater to fit in today than it was when I was a kid. Carson is deathly afraid of standing out in class, which makes it difficult to ask for help, and even though he goes to a class designed to give him more time and individualized help with math, he feels the desire to be like everyone else. Which is human, in the end. The point in all of this, is that disabilities are only measured in our modern ability to understand them and why they differentiate us. Throughout history, disabilities of any kind were overcome based on intuition and perseverance. Or they were not, which is perhaps why they are not represented in greater numbers than three to six percent of the population like dyscalculia. And watching my son go through this is like a little window on my own childhood that wouldn’t be possible without him. It’s a little like time travel, wherein I can see into a particular time only because I’ve made it to this time, passed along my genes (the good and the bad) and now have a DNA portal to the past.